We are the newest motel in Waipukurau. These are just a few of the comments from our visitors book... "The best I've stayed in and I will be back" (USA), "Lovely, clean, delightful!" (England), "Enjoyable visit, first class accommodation" (Scotland), "Definitely the best, we will tell all our friends about this treasure" (UK), "Much more than we expected" (Sweden), "Great motel, great breakfast" (Auckland), "Fantastic, great hosts" (Auckland), "We know where to come!" (Wellington). Come and stay with us and we will go out of our way to ensure you will want to come back! 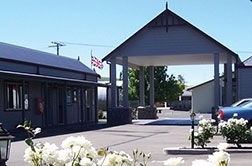 Waipukurau has the enviable Hawke's Bay climate, picturesque views to the Ruahine Range and surrounding hills, a relaxed pace of life and warm, friendly people, and Fergussons Motor Lodge is the place to stay! 12 luxury ground-floor units (all non smoking), furnished with quality chattels and tasteful decor, plus much more. Experience our rivers and beaches, "unpopulated, unpolluted, unbelievable". Central Hawke's Bay's fishing is legendary. Situated in Peel street. We are very easy to find, second turn on your right over the bridge coming from the North, and from South just follow the road round when you come over the railway line.